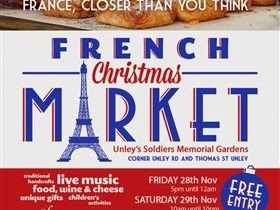 It’s on again – the French Christmas Market – over 2 days and 2 nights. Presented by Alliance Française d'Adelaide at Unley Soldiers' Memorial Gardens, Unley Road. Councillor Peter Hughes and I were the drivers to make this happen last year. This will be a great opportunity to celebrate the Franco-Australian friendship, and pay a very special tribute to the Australian soldiers who gave their lives during the First World War, with an aerial parade and a cine-concert ceremony on Friday. On Saturday, children and adults will be able to enjoy a large choice of fun festivities, as well as the yearly launching of the Beaujolais Nouveau and a concert under the stars in the evening. The market will feature a great panel of French specialties: from wine and cheese to delicious croissants, traditional handcrafts and gifts. How to vote in Goodwood (in the Unley Council election)? By now, most people who intend voting in the Council election should have made up their minds. However, if you are doubtful then I ask that you consider supporting me. It's a strange election this year. 2 are doing very little (at least they seem to be doing very little); they seem to be rather inactive. There is a reliance on a few posters on poles without any more substantial information available. Posters are being ripped down by residents offended by the visual pollution. For the record, I have not erected a single poster on a pole. I'm busy distributing my election material and door knocking and catching up with people on the street. I'm listening to their concerns. Vote 1 Bob Schnell Put Bob in Box 1 Your voting paper should be posted by Tuesday 4th November to meet the delivery deadline of Friday 7th November @ 5pm. There are 2 weeks before voting closes. In Goodwood Ward there are 4 candidates. When you review the candidates and consider their merit, ask the following questions. Who is local and lives in the Ward? Who is a member of a political party or has stood for State Parliament as a member of a party? Who is a member of an activist group? In my case, the answers are Yes, No and No. I am the only true Local Independent. Vote 1 Bob Schnell.Don't waste your vote. 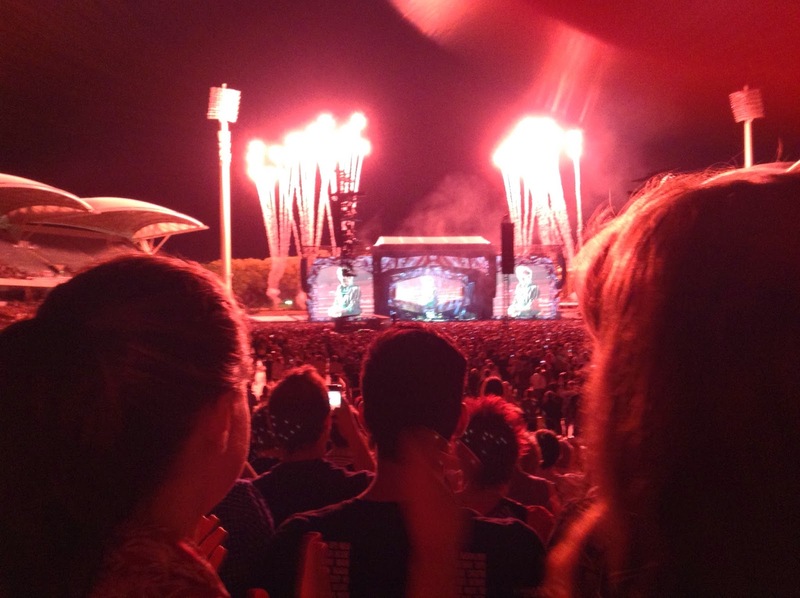 Went to the Rolling Stones concert - Adelaide 14. A full house @ Adelaide Oval. I was surprised by the huge talented backing contingent on stage; vocals and instruments. At times the backing became the feature. The Stones may be ageing, but with the strong backing support they've got a few more years to go. Plenty more satisfaction to give. Resisted buying a $50 t-shirt. 50% of patrons were baby boomers (and older). They didn't need their hearing aids to enjoy the music. Most had bladder problems and had to stumble along the aisle to get out. Or they were going to get another beer. During my recent walkabout across Goodwood, Wayville, Forestville and Everard Park, whilst I was delivering election leaflets and chatting to people ... I spent the time to check out people's gardens. Spring has rushed upon us and the gardens are blooming. The roses everywhere are fantastic. It's the best season we've had for several years. For so little effort, just a hard prune in winter and a spring feed and a couple of months later the roses are blooming fantastic. Tip: after the rose petals fall off, remove the heads and they will shoot again and create a fresh mass of flowers. Don't worry about excessive pruning, but as the season progresses don't prune too far down the stem. Control how high you want the rose bush to grow. Today the postie delivered ballot papers to my home. Reports from Fullarton are that the ballots are arriving there. I'm impressed by how quickly Australia Post is delivering the ballot letters across Unley. The postie bags must be bulging. On the down side, given the poor condition of many letter boxes, there will be some letters falling onto the footpath. I noticed letters hanging from letter boxes or on the ground during my walkabout delivering election material to every home. I'm forecasting an average voter participation of 25%. Now, back to my ballot paper. I'm not going to waste my vote. Last night (Monday 20-Oct) I met a woman who said that she had already voted. She voted in the Unley Ward election. I was staggered that the ballot pack was received by post on the Monday and that she voted immediately and popped it in a red Post Box before 6pm. It takes all types. However, I guess she fits the pattern of a small group of people who handle their voting business very quickly. Vote 1 Bob Schnell Don't waste your vote! Unley Council comprises 12 Councillors and a Mayor, all elected by the residents. Many other SA Councils have 13 members, some more, some less. What I'm about to say about Unley would equally apply to all other metropolitan Councils. Council is an interesting mix of people, thrust together as a result of an election. There are teachers, plumbers, engineers, developers, builders, pharmacists, IT dudes, journalists, lawyers, retirees, you name it ... Actually, there is no plumber on Council. 13 people are brought together and meet weekly and socialise at Council and community events. 13 people who would normally not socialise with many of the others outside Council. The group is somewhat, but not overly, representative of the community at large. Many are described as community leaders and yet most were not prior to getting elected. Once on Council you become (or are considered) a community leader and representative. We are strangers brought together. The weather forecast for this week is absolutely ideal for walking the streets, dropping election campaign leaflets in the letter boxes and talking with residents. Expect something in your letter box this week. I'll be in your street soon. Remember, Vote 1 Bob Schnell. Put Bob in Box 1 to make your vote count. I was shocked to receive an email from a candidate for Councillor in Unley. It was from a potential Councillor, one of the newbies. It was an invitation to join a 'League of Councillors' to stand up, to stand together. Effectively it would be a bloc, a voting bloc, a voting faction. I campaign hard as an Independent and won't be joining the Loony League. Residents expect their local representative to truly represent them and not vote on issues as dictated by a faction. Actually, it was a stupid tactical move on the part of the newbie. It will work against him/her and anyone who joins. Councils (eg. Burnside) in the past have been disrupted by factions. The whole fabric of local government was destroyed. We don't want that in Unley. Vote for a true Independent! I’ve been out and about talking with locals and I forecast that it’s going to be a rather low key, ho-hum Council election. The voter participation was expected to be about 30%, no higher. I reckon it will be way down, perhaps as low as 20-25%. Voters know that it is not compulsory. They know there will be no fine for not voting. They are also tired of voting. There was the Federal election followed by the State election 6 months later. Now, 6 months later there are Council elections. The difference is that this time, they don’t have to vote. Another factor is that there isn’t a Mayoral election. Mayor Lachlan Clyne got elected unopposed ie. not one person stood against him. If there is a Mayoral election, then that usually pumps up the voter participation by around 5%. Meanwhile, all is quiet on the Goodwood Ward front. No-one is distributing leaflets. Everyone is keeping their powder dry. No candidate wants their magic words to appear on another candidate’s leaflet. Don't waste your vote at the approaching Council election. In Goodwood Ward there are 3 other candidates for Councillor. There are 2 positions for Councillor. Councillor Bob Schnell is the only candidate who can effectively deliver outcomes. He has a good track record of serving the community and achievement. It is important to have retention of experience and local knowledge. In my election newsletter I have mentioned the upgrade of Forestville Reserve. It was devastated by the SA Government Goodwood Junction Rail project. Trees were removed, the fitness equipment was removed, the basketball court was lost etc. The whole eastern section near the rail line became a waste land. A fantastic win by the Rabbitohs over the Bulldogs in the NRL grand final last night. It was such a rough and brutal game. I think most of SA were backing the Rabbitohs. But what was Russell Crowe wearing? That white jacket looked like a Vet's coat.